You sense the colors of playing cards through a solid table. You stack four Poker hands in less than ten seconds. You kick any named number of cards off a tabled deck. You put chaos to order. You magically move cards to any positions in the pack at will. You transpose a card from between a spectator's hands to under his watch. You instantly memorize the order of a shuffled deck. Card Fictions will not enable you to do any of those things. Most of them are, after all, impossible. Fortunately, however, we can make our spectators experience these impossibilities anyway. 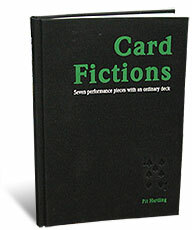 We do that by creating fictions; in this case Card Fictions. This book had been at the back of mind for a while and i had been edging to get it. After asking Joshua Jay what he thought about it, it gave me that extra kick and i went and bought it along with Tangled Web. Im so Happy i purchased this its worth every cent. The book itself was much smaller than i thought but man the stuff inside those pages. Many of you no doubt have seen Finger Flick off of David Blaines most recent special. This is acually a beautiful 3 phase routine. The tricks are gone into in depth and are easy to understand. Though i wouldnt recommend this to a beginner it has some sleights that could be seen difficult. This is for the card worker i think even memorized deck workers will get a few things out of this a few presentations they might be able to expand apon. I think this is an AMAZING purchase and you must pick it up. Thanks Joshua for helping me make the decison to pick this up!